PRODUCT: PAM P13KUE Universal Autofeed Screwgun Kit. Converts from Short to Stand-Up Drive Type. Drives 1-3 inch #6-#12 Collated Screws. 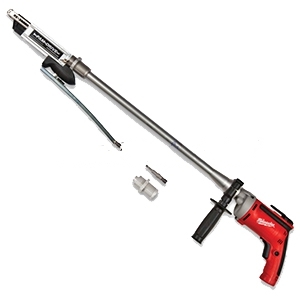 Kit includes 2500 RPM Milwaukee Screwgun, Universal Extension System and Case. Price/Kit. Use with or without standup extension. Fast change option allows for quick change over to different screw sizes. Autofeed collated screwgun. Drives 1-3" long #6-#12 fasteners. Includes Milwaukee 2500RPM 6.5A Screw Driver. Precise countersink adjustment on the fly...no tools necessary.